The courses offered are certified and precisely designed with full grace of learning. 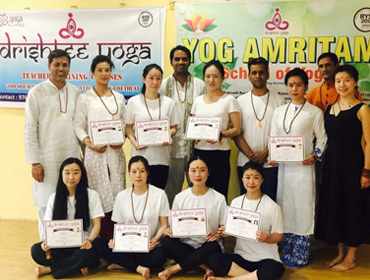 It is highly considered that yoga seekers or aspiring teachers will receive the transformational lessons to evolve with basic to an advanced level of yogic practices. The residential Hatha Yoga, Astanga Yoga Teacher Training Courses include accommodation with food and excursions. 2. There is no minimum experience requirement. 3. The applicant must be ready to adapt to the ashram and yogic lifestyle. the correct alignment in the final position, the Sanskrit name and the English name, the modifications, the benefits and the contraindications. includes the theory and practice of the essential methods of pranayama. both in your asana practice and during seated meditation at the end of each day. bring strength to your muscles, organs, respiratory system and chakras. In addition it will allow you to experience the rhythm of meditation in motion. in our 200 Hour Classical Hatha Yoga Teacher Training course. Anatomy: Our Hatha Yoga Teacher Training program provides education in the skeletomuscular system, nervous system and respiratory system. As well we teach the anatomy of the chakras, nadis and the koshas. and to giving you opportunities to teach your fellow students.